Aside from ACT scores, the data in this Fact Book all come from official government sources, including local school districts, the Kansas Department of Education (KSDE), and the U.S. Department of Education. All data are the most current available and, unless otherwise noted, span through the 2016- 2017 academic year. Additional information (including annual historical data) for individual school districts is available on our transparency site, KansasOpenGov.org, and on the KSDE site at ksde.org. 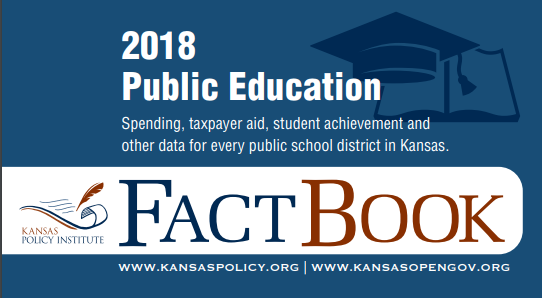 We compiled this Fact Book because scientific surveys show that citizens are largely misinformed on many pertinent facts of public education in Kansas. Aid and spending per-pupil are much higher than many Kansans believe, and student achievement is lower than understood. Many Kansas students are doing quite well, but thousands of students each year are falling behind, and a false sense of high achievement is a tremendous barrier to getting them the help they need. State assessment results from 2017 show that only 40% of Kansas 10th graders who are designated “not low income” are on track to be college and career-ready in English Language Arts. This number falls to 17% for 10th graders designated “low income.” In Mathematics, only 34% of “not low income” 10th graders are on track to be college and career-ready. This number falls to 11% for “low income” 10th graders. In short, it’s intuitive to believe that more money is needed to close achievement gaps but as shown in Table 11, student achievement on independent tests remains unchanged despite billions more in taxpayer support. Table 17 illustrates that many states get the same or better results while spending less than others. Indiana, for example, spends considerably less per-pupil than Kansas but gets better results across nearly all the grade, subject, and income groupings shown. At the very least, this indicates that it’s not how much is spent that matters; it’s how the money is spent. Kansas taxpayers are investing a lot of money into public education. Indeed, Table 1 shows that taxpayer support of public education in Kansas amounted to $6.084 billion, or 13,236 per pupil, in 2017. KSDE estimates that 2018 support will set a record at $6.471 billion, or $13,647 per-pupil. Accurate information is necessary for good decision-making. We hope you find this Fact Book useful as you reach your own informed decisions regarding public education in Kansas.